I perform a lot of SharePoint installs. I like to Slipstream both the Service Pack and the Cumulative Updates before I begin an install. In the zip file you find the batch file and links to the latest MOSS 2007 and SharePoint 2010 Service Packs. I will keep this zip file up to date when new Service Packs and Cumulative Updates come out. New Farm – Slipstream base binaries with SP’s and CU’s > Install Slip-streamed binaries on all boxes > Configure SharePoint. By default the “Updates” folder in the directory containing the base installation does not have any files in it. Once the 4 files are extracted you should have a little over 900 files. 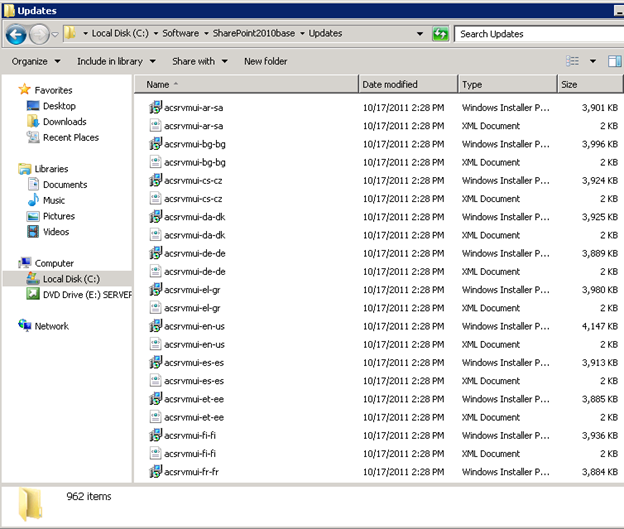 In this case my “Updates” was about 2.04 GB when I slip-streamed SP1 and the October 2011 CU’s for SharePoint 2010. This entry was posted on Wednesday, November 16th, 2011 at 9:29 pm and is filed under SharePoint 2007, SharePoint 2010. You can follow any responses to this entry through the RSS 2.0 feed. You can leave a response, or trackback from your own site.